Walking into the office each morning, you are already performing mental gymnastics trying to figure out how you’ll get through your task list for the day, only to be confronted by twenty equally urgent and demanding messages, and the phone ringing off the hook. Sound familiar? The past decade has seen meteoric advances in communication, with emails, Facebook, SMS, Twitter, Skype, Ping, blogs, feeds and a myriad other indispensable forms of ‘connecting’ and absorbing information. With such resources at our disposal productivity should be soaring, shouldn’t it? However, whilst the world may well be at your fingertips, you are unfortunately equally within reach of the world too. Managing this bombardment of information you receive everyday and juggling the resulting tasks is in itself a full time job. There just aren’t enough hours in the day – so what can you do? Well you can start by creating more time. Using Mind Maps can streamline your working day and is proven to improve productivity by 20% – that means you can gain an extra working day every week! 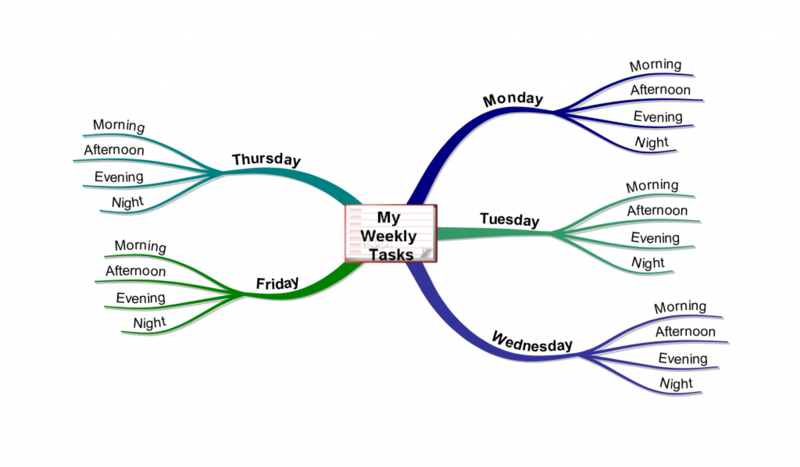 How can Mind Mapping improve my productivity? One of the simplest and most effective ways to use Mind Mapping and boost your productivity is to begin each day by spending five minutes creating a Mind Map ‘to do’ list. This will allow you to view and review your tasks, prioritising according to deadlines and realistically determining what is achievable in the time you have available. As you build your Mind Map you can get a clear picture of your workload and view each task objectively. You can determine what’s important and what’s not, see how certain projects will relate and impact on other tasks, and block your time to achieve optimum productivity. 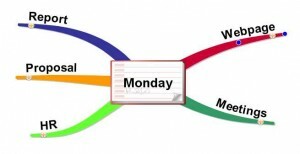 A good way to track your progress through the tasks is to create a separate Mind Map with the main branches as different time segments of the day. Then select tasks from your day’s Mind Map to add onto these branches, creating a schedule for the day. With the iMindMap software you can copy and paste branches between maps as you schedule them to be done so that you are left with a clear picture of what is left to do. There is no need to start again or re-draft your maps so you can save even more time with iMindMap. How can Mind Mapping help me long term? There is no need to restrict this to a daily schedule. The same principles work for weekly, monthly, even annual planning. You can create main branches that cover broad topics, such as Finance, Personal Development, any long term projects, personal issues – any thing that requires action on your part. Then use child branches to drill down into tasks, deadlines and deliverables. A Mind Map allows you to group tasks or ideas in a limitless radiating structure, so you can have a clear, organised picture of what you need to do to achieve your goals all in one place. Another time saving tip is to create templates for your work schedule that you can use daily or weekly. You can either pre-draw and photocopy a number of these, or add a template into the iMindMap software. Then simply add on the tasks to be completed to the relevant time periods. How can iMindMap consolidate and share information? With the iMindMap software you can easily share your plans with your colleagues with the click of a button. Export to other office applications such as Microsoft Word, Excel and Project, as well as OpenOffice and iWork, or simply send your maps as image files. You can also attach files or links to your map, such as spreadsheets, meeting agendas, proposals, web pages, audio files – any relevant information can be stored in one place, easily accessible. The flexibility of the software is designed to make your life as easy as possible and to facilitate high levels of productivity. Productivity is about streamlining your work practises and making the most of your time. Mind Mapping can be easily incorporated into your working day, providing a space to keep track of your ‘To Do’ list in a concise, practical and productive way. Regain control of your workload, reach new levels of productivity and lower your stress levels with Mind Mapping!